Like many landmarks around the world, the Erasmusbridge in Rotterdam has been illuminated with the colours of the French flag. A vigil in solidarity with France has been taking place in New York’s Washington Square Park. President Obama has held a meeting of his National Security Council before leaving for a summit in Turkey. At the briefing he was told there was “no information to contradict the initial French assessment of ISIL’s responsibility”, using an alternative acronym for Islamic State. 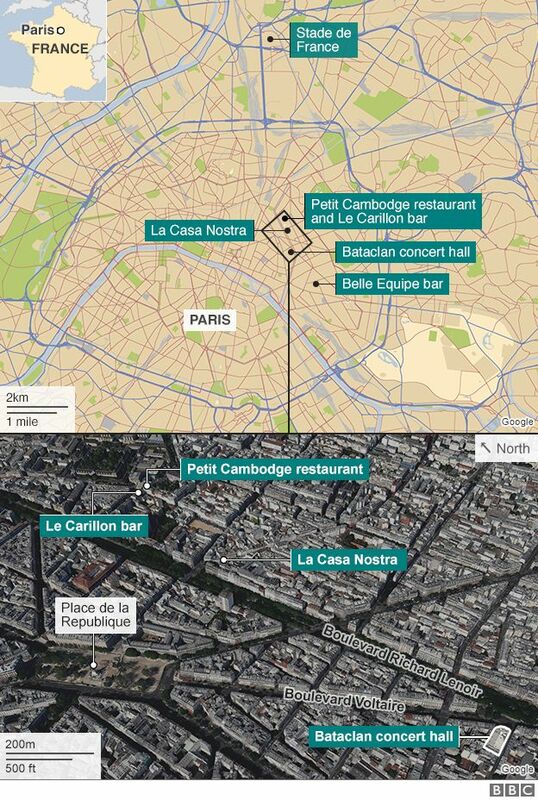 image by AFP, via BBC. Prince Charles, right, observes one minute’s silence in the Australian city of Perth. At a ceremony in Tel Aviv, Israelis are lighting candles for those killed in Paris. Candles are burning alongside flowers which are being laid out at embassies across Europe. The Irish band U2 have paid their respects outside the venue where they were due be performing this evening. They have cancelled two performances in the French capital. Iconic sites around Europe are being lit up in the colours of the French flag.